It was a season of destiny for St. Paul football, until it wasn't. On a foggy, frigid Saturday at Hillsboro Stadium, the No. 3 seed Buckaroos lost 38-32 to No. 1 Dufur, coming up a touchdown short of their goal of a Class 1A state championship. The Bucks entered the title game 12-0, their closest contest a 46-16 win over Wallowa in the semifinals a week prior. They were averaging just over 63 points per game and boasted a nearly unstoppable offense. But on the other side of the field was a Dufur team that was also unbeaten and had won the previous three 1A state championship games. The Rangers were not eager to let the newly rechristened 1A St. Paul football program knock them off their lofty perch. The contest presented itself as a clash of small school titans and played out as such in the opening first half of football. Dufur struck the first blow, taking its opening drive on a 12-play, 61-yard march down the field that culminated on a one-yard touchdown run by quarterback Derek Frakes on fourth down. It took three plays for St. Paul to respond. Taking advantage of a 43-yard kickoff return by T.J. Crawford, the Bucks opened their drive in Dufur territory. After a pair of runs by Justin Herberger to put the ball near the goal line, Crawford took the ball up the middle for the Buckaroos' first touchdown to make it 8-8. From there, the two teams combined to score 46 points in a wild second quarter. Every time Dufur would score, St. Paul would match with one of its own. The Bucks got their first break late in the period after stopping the Rangers on fourth down to recover the ball with a little over two minutes on the clock. Herberger uncorked a 53-yard run to set up a 7-yard touchdown pass from Crawford to Jaidyn Jackson two plays later, and the Bucks had their first lead of the game: 32-24. On the ensuing drive, St. Paul appeared to have Dufur on the ropes after Alex Dela Cerda sacked Frakes to make it fourth and long deep in Ranger territory. But the Bucks were called for unsportsmanlike conduct on the play, giving Dufur a renewed set of downs and the second chance it needed. The Rangers quickly moved down the field, scoring on a touchdown from Frakes to Cole Kortge to make it 32-30. St. Paul stopped the two-point conversion to conserve its lead going into the half. Coming out of the break, the heavy offense of the first two quarters was exchanged for defense in the third. 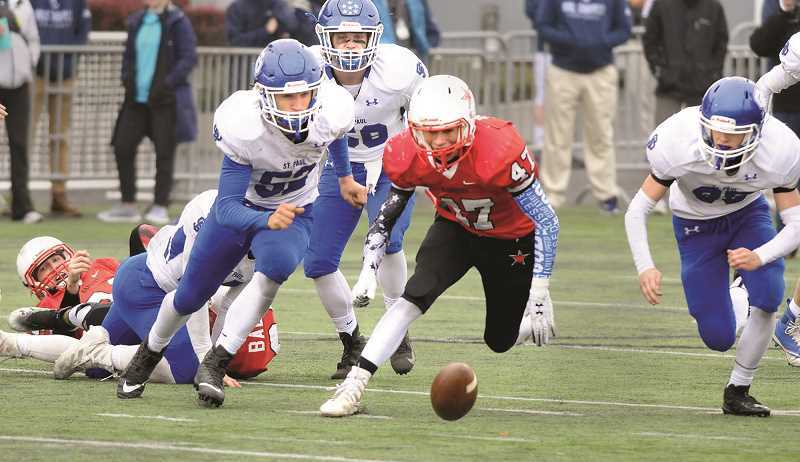 St. Paul's first punt of the game — early in the third quarter — presented a disastrous shift in momentum. The snap was bad, the Rangers got a hand on the kick, and it ended with a safety that tied the game at 32-32. "We had some guys open and we missed them," St. Paul coach Tony Smith said. "We didn't sustain blocks up front, either. It was just a night and day difference from the first half." As the defenses tightened up, neither team could get a foothold offensively. St. Paul forced Dufur to a pair of punts and an incomplete fourth down conversion in the third quarter. Likewise, the Rangers locked down the Bucks, forcing St. Paul into a three-and-out and two turnovers — the last of which proved to be the decisive play of the game. With the Bucks preparing to lead their third drive of the quarter from their own 14-yard line, Crawford's pass was intercepted by Tanner Masterson, who returned the ball back for the touchdown that put the Rangers ahead for good. St. Paul defended the two-point conversion, but the damage was done and Dufur led 38-32. St. Paul's next drive went backward in three plays and ended with another punt. The Rangers took over possession and mounted a 19-play drive that ate up more than nine minutes of the fourth quarter. Though the Bucks stopped Dufur two yards shy of the endzone, the drive left St. Paul with just 1:12 to move the ball 98 yards to tie or win the game. But the Dufur pass rush was too much to overcome, and the Bucks' drive ended at the nine-yard line. A quarterback kneel by Frakes sealed the game and reinforced the Rangers' place as kings of 1A football. St. Paul, meanwhile, left the field expressing disbelief and frustration. Its season wasn't supposed to end like this, but Smith told his players in the postgame huddle to keep their heads up and not let one game define them. The Buckaroos graduate nine seniors: Eric Diaz, Francisco Vargas-Ayala, Rawley Koch, Herberger, Ethan Garofalo, Zach Brentano, Aidan Kirsch, Israel Cisneros and Jackson. Among this group, Herberger and Jackson were the biggest contributors, leading the ground game and receiving group, respectively. Herberger led both teams with 125 rushing yards and a touchdown on 14 carries, while Jackson led the Bucks with five receptions for 57 yards and two touchdowns. Crawford finished the game 7-of-17 for 93 yards and two scores. Defensively, Vargas-Ayala led the team with 14 tackles, while Diaz and Herberger each had 12 and Dela Cerda added 11. "It was a great group of seniors," Smith said. "A lot of them are two- and three-year starters. Their commitment, the kind of kids they are and the work they do in the classroom has been outstanding. We couldn't be prouder of them and their effort this year." — Phil Hawkins contributed to this story.